Something I notice about African cooking from one 'style' to the next is the commitment to extraordinary taste - be it African American, Caribbean or Continental African. Each cuisine, cooked from the heart, is based upon how you feel, what you got, how it taste in the moment, and how you want it to taste in the end. I was raised cooking African American Soul food (Southern, Northern, Creole, and Western) and later adopted Caribbean and Continental African Soul foods as well. 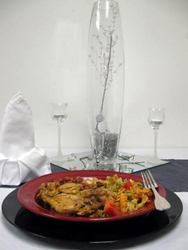 create for you an 'African Theme' menu from scratch.